An online first-person shooter with heavy RPG elements set in a space opera universe. Level up by shooting enemies and completing quests, collect loot and ammo drops, and raise your reputation with various factions to buy unique and powerful items. There are three character classes to choose from and each has their own skill tree that allows for a certain amount of role specialization, but every class is viable for solo play as well. There are a variety of types of missions - story missions and procedurally-generated “patrol” missions can be played solo or in groups, while “strike” and “raid” missions require groups. The game is gorgeous and the game feel is phenomenal. The moment-to-moment experiences, especially in combat, are polished to a shine. The longer-term loop is founded in improving your character and gear, but the loot drops are less central to this than in a game like Borderlands 2 . Instead, post-story-campaign advancement is mostly through teaming up to take on progressively harder strikes and raids or progressing through the PVP arenas, similar to the model in games like World of Warcraft . The story in the base game is sparse and disconnected, though the atmospherics are strong and set a clear and consistent mood, and later expansions fleshed out and improved the story. The inventory is too small, but there is a quick sell mechanic and - bizarrely - a companion app that makes it easier to manage. While there isn’t much in the way of cosmetic character customization, there are a variety of “shaders” that allow you to apply distinctive color themes to your armor. It’s worth noting that the game has an unusual pricing structure. Although the game is online-only, it was released as a full-price premium retail title. While the game doesn’t have its own subscription fee, if you aren’t subscribed to your console’s premium service (PlayStation Plus or Xbox LIVE Gold) many significant features are off-limits and all you can really do is solo the story campaign. Additionally, when new content was added the bulk was bundled in paid expansions. Vanilla players received patches and small content updates that mostly served to advertise the expansions. A new faction would be added and you could grind rep with them for some neat rewards, but to get the higher rep tiers you needed to buy the expansion and get access to their story quest chains. World events tied to the new story would affect all players but only really reward people with the expansion. And worst of all - weekly quests would sometimes require the new expansion to be playable, effectively downgrading the game for people without it. On top of all this, new expansions tended to be bundled in a way that punished the game’s most loyal customers. The low point was the release of the third expansion, “The Taken King”, which cost $40 alone, $60 bundled with the base game and both prior expansions, and $80 additionally bundled with some unique bonus content that couldn’t otherwise be aquired (after an outcry the bonus content was eventually made available for separate purchase). 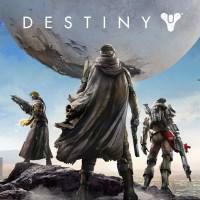 The cumulative result is that it felt like it was never the right time to buy Destiny . Things were set up to lure in new players with discounted bundles, but before long you’d be made to feel that your investment was outdated and you were pushed to buy the latest expansion at a worse price. 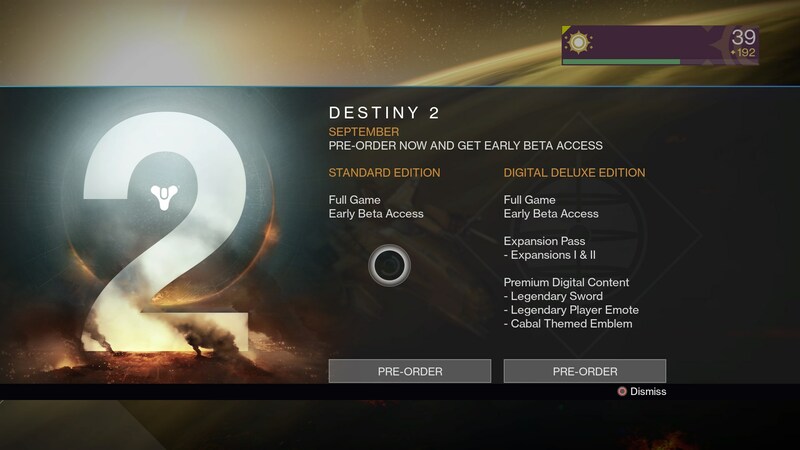 And as soon as the expansions stopped coming and it was finally possible to just have and enjoy a complete experience, the game started serving up advertisements to pre-order the sequel. Destiny is a solid game, and after the improvements and additions of its expansions it may even be a great game. But it’s overshadowed by the exploitative and disrespectful way it was packaged and sold. It’s hard not to consider this a shameful waste of potential. I Stopped Playing When: Senpai-chan and I finished the story campaign and teamed up to take on strikes and side content for a while, but it became clear we couldn’t meaningfully progress much further without joining a guild or otherwise teaming up with larger groups to take on raids, which we were uninterested in doing. We were also not interested in spending money on the expansions for more story content, given our problems with how they had been packaged.